There is the old saying that love is blind and a divorce opens your eyes. According to the latest statistics in the United States, 40% of all marriages end in divorce. Thailand is also seeing an increase in their divorce statistics. [See: Thailand Divorce: Statistics] It makes one wonder why so few are having prenuptial agreements signed in the first place. It is rather clear that the odds are stacked. ‘Prenup’ or Prenuptial Agreements may be drafted in Thailand. There are many advantages of having a prenuptial agreement in Thailand. The benefit unfortunately only comes to play at the end of a marriage usually when it is too late. The numerous advantages of a Prenup or prenuptial agreement are that it affords your property protection from your spouse during a divorce. A prenuptial agreement protects you if you are divorced and married again in Thailand as any children from your first marriage can be protected as you will ensure that they inherit their fair share. 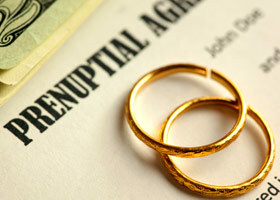 The prenuptial agreement will protect you from creditors pursuing your spouse. This section stipulates that in Thailand matrimonial assets, without any special agreement (such as a prenuptial agreement) concerning their properties will be governed by this chapter. This is a very important section in the Civil and Commercial Code of Thailand. It states that a ‘prenup’ or ante-nuptial agreement that has not been signed by both parties and two witnesses and entered into the Marriage Register at the time of the marriage registration – is void. There can be no amendments after it has been entered into the Marriage Register unless authorized by a court. Always obtain the services of a reputable law firm to draft and register your marriage in Thailand. Lower your costs and risk by speaking to an attorney about your prenuptial agreement.